In his hometown of Schenectady, N.Y., Riley starred in both football and basketball. 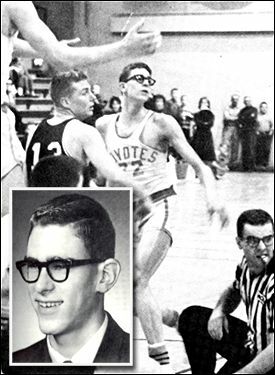 In a 1962 Christmas basketball tournament, Riley scored 19 for Linton High School in a win over Kareem Abdul-Jabbar (then known as Lew Alcindor) and Power Memorial High. Nineteen years later, Riley would become Kareem's coach with the Lakers. "He stoops only for a door, and all look up to him." Phi Thetta 4; Pep Club 4; Letterman's Club 2, 3, 4; Coyote-on-the-air 4; Playmaker's 3, 4; Boys' State 3; Junior Class Play, Senior Class Play; Sophomore Class Offices; Capers 2, 3, 4; Varsity Football 4; "B" Football 2; Varsity Basketball 2, 3, 4; Track 2.